A counting book and a cautionary tale, translated from Dutch. Anthropomorphic animals appear fully clothed, in bright outline, on solid-color pages, each of which faces its number and text. “1 / shopping bag / Look what Mama’s brought!” appears opposite Mama, carrying a full pink-striped tote that coordinates with her green-striped gown and hood (shaped nicely to accommodate her ears). 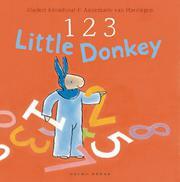 The protagonists are Little Donkey in blue coveralls (and eared hood) and Bobby, a little bovine in red pants. The two find 3 bags of treats, and 4 eyes gaze pleadingly at Mama, who puts the treats on top of 5 kitchen shelves. But the two find a ladder with 7 steps, with predictable results (8 hooves flying). Mama soothes them both with 10 kisses. The pictures are clear enough so that children can count the treats and hooves and even the 9 tears themselves. Very young children will probably not find the shapeless outfits or Little Donkey’s and Bobby’s tails odd, but slightly older children might. Little Donkey’s cover image is a raised and shiny figure, and the effect of the flat but saturated color backgrounds (including hot pink endpapers) makes for some engagement.